So are you asking yourself “what the hell is Xeriscape?” And how do I pronounce it. With the last being first, it is pronounced “zeer-i-scape”. The word is derived from a combination of two Greek words: “xeros” (dry) and “scape” (view). Xeriscaping is a landscaping philosophy. 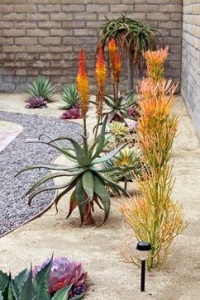 It uses native, drought-resistant plants and arranges them in efficient, water-saving ways. 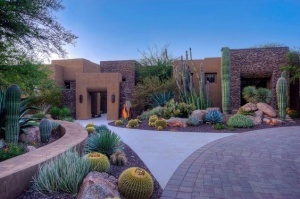 For Tucson homeowners, it is the prevalent landscaping approach in use. But, as hard as it may be to believe, Tucson was once a city of lawns. Bermuda grass lined residential neighborhoods. Kept green — even in blazing summer months — with diligent watering. Over the decades, that has changed. Most Tucson residents avoid lush lawns in favor of Xeriscape landscapes. And it is more in tune with the city’s desert setting. But it doesn’t mean there’s no “green” at all. Since the 1980s, Tucson residents have replaced their green lawns with decomposed granite. And planted paloverde trees and cactus. These hardy desert plants can endure long periods of drought and extreme heat. The stimulus for Xeriscape started in the ’40s and ’50s. After WWII, Tucson began to grow – fast. So fast, the city’s infrastructure couldn’t keep up with the expanding communities. Tucson’s water distribution system was not able to meet the demand. Now this is interesting, water demand would peak during the work week between and 4 PM and 8 PM. Want to know why? As the population grew into the 1970’s people would come home from work between 4 pm and 5pm. And the first thing they did was turn on the irrigation system. No timers yet! Then do their laundry. That resulted in a huge burden on the distribution system. As people used more water, the unit cost would go up. No volume discounts on water usage. The council’s actions was so unpopular, the community held a recall vote. All council members who voted for the new rate structure were voted out. But, and this is a big BUT, the rate structure they put in place remains in effect today. The good news in this story is that the rate structure drove down Tucson’s per capita water usage. From about 160 gallons per day in 1980 to a bit over 120 gallons per day in 2017. A whopping 25 percent drop! So by increasing the cost of water, people changed their habits and concepts on landscaping. And Xeriscape was born. The idea was adopted by park and gardening center staff. It save water and made maintenance easier. But despite its growing acceptance as a landscaping style, many people still don’t know what Xeriscape is. An interesting sidebar is that people who don’t know what it is use the techniques involved. Why? As before it saves money for water and is easier to maintain. Oh, and it looks great as well. Some people use the term “zero-scape”. Which implies no water at all. Others think the practice means the use of barren, rocky landscapes and a few cacti. The good news is Xeriscaping doesn’t have to mean a bunch of tumbleweed is put in the yard. It uses native plants. Landscapers can select from the plant varieties of the region a home is in. A Xeriscaped lawn can look as attractive and colorful. But grass and plants needing water are kept at a minimum. But they don’t have to be eliminated. Proper use of Xeriscape principles can reduce water use for landscapes by 60 percent or more.And save money. First, Xeriscapes do not have a single look. The principles apply to all or part of a yard, in any region of North America. And for most of North America, over 50% of residential water used goes to landscape and lawns. Xeriscape can reduce landscape water use by 50 – 75%. 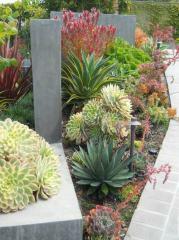 The fundamental element of Xeriscape design is water conservation. Landscape designs should reduce the amount of applied water and maximize natural precipitation. Start by reviewing the seven principles of Xeriscaping. Then take a tour of your local nurseries. Make a list of the available drought-resistant plantings. If you are doing it yourself, make a drawing looking down on the area from above. Orient the plot by marking down north, south, east, and west. You’ll want to group plants with similar watering needs for more efficient water use. Study the natural contours and drainage patterns of the land. Contours make perfect terraces and add visual interest. They will help reduce soil loss and erosion due to rain or irrigation. Consider the planned use of each area within the plot. Define areas for seating, walkways, visual barriers, dining, or play. Areas with turf should be designed with mowing in mind. Curved swaths are usually better than straight runs with sharp turns. Larger plantings, shrubs, and trees provide natural heating and cooling opportunities for adjacent buildings. The ideal soil in a water-conserving landscape does two things. It drains well and stores water at the same time. Increase the amount of organic material in your soil and keep it well aerated. Compost is the ideal organic additive. But NOT when the Xeriscape contains many succulents and cacti. These species prefer lean soil. It may be worthwhile to have your soil tested at a garden center or by using a home test kit. Most Western soils tend to be alkaline (high pH) and low in phosphorous. Adding bone meal and rock phosphate will help. Reduce the size of turf areas as much as possible. But leave some turf for open space, functionality and visual appeal. For best results, select plants that are native to your region. Use drought-resistant plants. They have leaves which are small, thick, glossy, silver-gray, or fuzzy. All characteristics which help them save water. For hot, dry areas with south and west exposure, use plants which need the least water. Along north and east-facing slopes and walls, choose plants that like more moisture. Don’t mix plants with high- and low-watering needs in the same planting area. Trees help to reduce evaporation by blocking wind and shading the soil. Cover the soil’s surface around plants with a mulch. Mulch holds moisture and temperature. It will also prevent erosion and block out competing weeds. But keep in mind what area of the country you live in. In Arizona, wood mulch near a home is meals on wheels for termites, scorpions and, other critters. It may also be washed away during our summer monsoons. Water conservation is the goal, so avoid over watering. Soaker hoses and drip-irrigation systems are efficient watering for a Xeriscape. They deliver water to the base of the plant not “all over”. This reduces moisture loss from evaporation. Low-maintenance is one of the benefits of Xeriscape. But keeping weeds from growing up through the mulch may need some attention. Don’t cut turf areas too short. Taller grass is a natural mulch which shades the roots and helps keep moisture. Avoid over fertilizing. There you have it. Major TMI. But understanding Xeriscape practices should help you save water and money. And give your home great curb appeal. Our website provides information on subdivisions and neighborhoods in the greater Tucson area. Want more? Give us a call – 520-940-4541. We are ready to answer your questions and help you get the information you are looking for.